Get a Whiter Smile Today! Have you been a coffee drinker for years? Love tea? What about smoking? Eat a lot of apples or potatoes? All of those things can cause your teeth to yellow! If you have ever wanted a whiter smile, you’ll love the options available at Shorewood Family Dental Care! We have several whitening options available for you to choose from. You’ll absolutely love with our available treatments! With tooth whitening, the best option that we have, we take impressions on a patient and we make them custom bleaching trays. We show them how to use those and they take them home and they do the whitening at home when it’s convenient and usually that gives the results that the patients are happy with. Then if they need touch-ups, if they have a wedding coming up or something, they can just do the whitening at home and it really works out well. 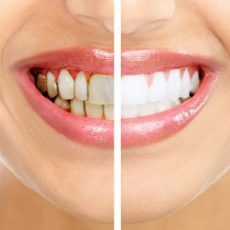 If you would rather whiten your teeth in the comfort of home, we can offer take-home whitening trays, a great solution for getting a professional quality teeth whitening for just a few minutes an evening! The biggest difference between professional at-home teeth whitening and over-the-counter solutions is a custom-fit teeth whitening tray that is made from an impression of your teeth. This enables the whitening gel to have a more even, complete distribution, resulting in a whiter, brighter smile! Your NiteWhite tray is worn for a few minutes each night, and most patients get the results they’ve dreamed of in as little as two weeks! We also offer Opalescence, an at-home teeth whitening solution that is non-custom, but still delivers the quality results of professional teeth whitening. This system is ideal for patients who want whiter teeth without the huge price tag. Opalescence is the perfect teeth whitening solution for someone who wants a ready-to-go system that is better than a drugstore brand. No matter what kind of teeth whitening in Shorewood, IL procedure you want, our team can deliver results! If you’re ready to get a white, bright smile today, call our office at (815) 725-5991 or fill out our online appointment request form. We look forward to giving you a reason to smile!